Firebird, 2006. First published in 1994. 324 pages. Bloomsbury, New York, 2007. 306 pages. I picked up many Advanced Reading Copies of books at the ALA Conference last June, but the one I was by far the most excited about was Shannon Hale’s new book, Book of a Thousand Days. Mucker maid Dashti lost everything when her mother died, so she went to the city to learn to be a lady’s maid. When she comes to the palace, the princess needs a maid–because her father is sealing her into a tower for a thousand days because she has refused to marry the powerful ruler of the neighboring land. Dashti is willing to be shut up in the tower with the princess and food for a thousand days. But when rival suitors show up outside the tower, events don’t turn out as expected. Can Dashti help her lady survive? 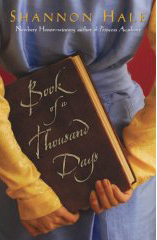 In many ways, Book of a Thousand Days reminds me of The Goose Girl, the book that made me fall in love with Shannon’s writing. Both books are lovely retellings of Grimm fairy tales. Both are phenomenal–wonderfully romantic, with a touch of politics and intrigue. In both, the fantasy is done with a light touch. Both books also involve a servant passing herself off as her Princess mistress. However, the two situations are complete opposites. In The Goose Girl, the lady-in-waiting usurps her mistress’s place. In Book of a Thousand Days, the humble servant only carries out the deception because of the orders of the fear-filled princess. In both books, we see character growth that rings true, and beautifully blossoming love, along with the forming of deep friendships during adversity. I’m afraid I’m starting to get skeptical about the romantic heroes in Shannon’s books. They are too wonderful! I’m starting to think they are a woman’s idea of the perfect man (They certainly fit my idea of the perfect man! ), and a real living breathing man could never come close. But so what?! 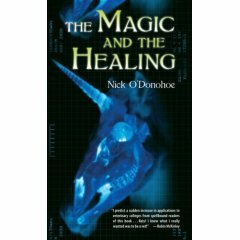 The magic in the book is done with a light touch, so it doesn’t hurt a bit to add another element of fantasy! This story is simple, and so beautifully told. Why does it strike me as one of the best books I’ve ever read? I don’t think I can put my finger on the external ingredients that make it so. All I know is that it touches my heart. Happy 2008! I’m starting off the year with a list of the books I most enjoyed in 2007, my list of 2008 Sonderbooks Stand-outs. Since I spent 2007 studying for my Master’s in Library Science (and I finished it! ), the reviews will take longer to post than this list. Don’t worry, they are on the way! If only I didn’t read so many good books! As you can see, I have trouble narrowing down my choices. I do recommend every book on this list. They are books that stood out in my mind after a year of reading. For fun, I’ve listed them in the order I enjoyed them, which shouldn’t be construed as a ranking of their quality. As always with the Stand-outs, I’ve categorized the books so so that I don’t have to make too many choices between wonderful but very different books. This year, I’ve added a category for audiobooks. Two of the audiobooks I listened to were the very best books I read in a previous year, so it didn’t seem fair to put them with the genre they are part of and have them top the list again. Instead, I ranked them according to my experience enjoying listening to them. You are currently browsing the Sonderbooks blog archives for January, 2008.